july has been a crazy rainy month in south carolina and it's driving us all a little batty. i captured a lot of great memories this week, although they are not all roses and sunshine and i wish they could be but this is real life. as a parent, i am learning more and more about what i want to teach my children. i think it's important for them to know, i'm not prefect, i will make mistakes, i will say i am sorry, i will love them unconditionally forever. for me, project life is about real life, the everyday, and i hope that somewhere down the road my boys will cherish the fact that i documented these things. i used the ali edwards's edge sentiments for the picture of the boys going through the catalog of tractors. the journal cards for the week card as well as the hearts and the here & now, are all from studio calico's project life kits. i have really been enjoying those kits and i find (sadly) that i am not using my seafoam edition project life actual kit that often. the little wooden camera is also studio calico. on the image of denton and his ice cream is another ali creation. on the image of the rainbow, i used illustrator and photoshop to write "somewhere over the rainbow." this week i changed up the plastic for this side, i used the becky higgins's design G for the layout, i like to see variety in the layouts. in the small 3 x4 areas, i cut down a 4 x 6 image, rounded the corners, i like the way the split pictures look. i used a white gel pen to write directly on the picture of the "intense" game of memory. on the image of lil' bit's 1st birthday party i used ali edwards's birthday hand drawn. the large journal card came for the studio calico project life kit, i then stamped ali's super fantastic stamps that i ordered from technique tuesday. over the stamping i then wrote on the journaling card with a precision pen from american craft. the time with you die cut is also from ali, its part of the 3 x4 time sentiment boxes, i scaled this to fit inside a 4 x 6 box. i scaled and cut it out on my silhouette. i can honestly say this year has been the most on top of project life i have been, usually i am a month of more behind. for me, the changes i made this week, working on a weekly story rather than an everyday story has helped me greatly. i think i am more excited in general with all the new ways there are to customize the look. no two people will have the same layouts. hope you are still enjoying your journey too! the week of the 4th of blue so much red, white and blue, i love it! this was a fun week, so many stories to tell here. we met some new penn state friends a couple of weeks ago and got to hang out with them at the zoo. i cashed in a giant change bottle that i have been keeping since i was 12.
i used some cathy zielske template this week, so fun to play with. i used them on the receipt and change image and the smaller image of us all at the zoo. 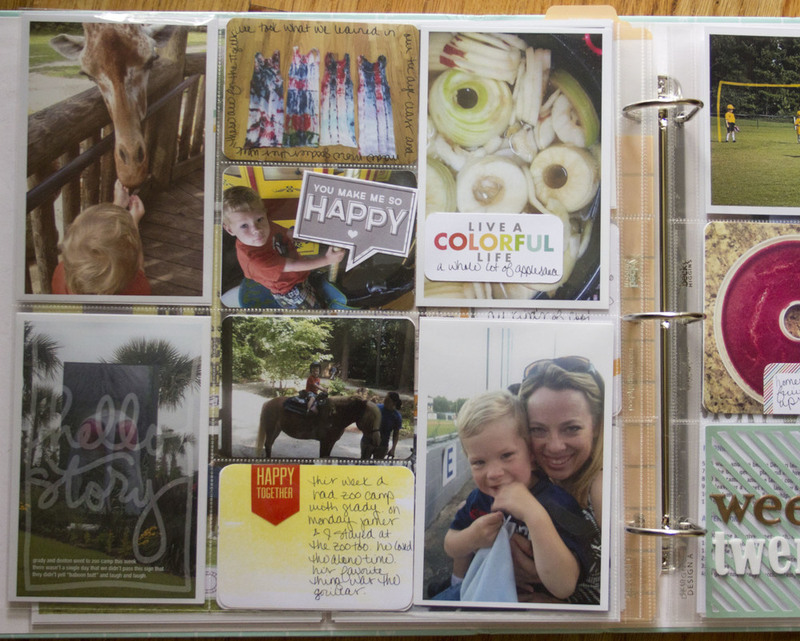 the journalling cards and the small on that i cut up to put on the image of the burgers are all from studio calico's project life kits. i have many kits now and while for the most part they are still in order i am not sure which cards are coming from which kits when i get behind in my blogging. sorry. i used small alphabet sticker from basic gray to create james's favorite movie's title, RIO, that kid can't get enough of seeing that movie. over the image of my hubby and me at our annual 4th of july race, i punch cut a heart from a studio calico project life card that was heart patterned. (i was 12 seconds slower this year than last, just an FYI). the alphabet sticker on the fireworks come from SN@P and i got those at michael's. the 4 is a card that was in the studio calico project life kit. i added wood stars also from studio calico. i used mr. huey's color mist in shade, overdue, to color the stars. another cathy zielske tiny template for the spaghetti sauce image, i was canning again, of course. the go. see. do is from the ali edwards's series, i heart travel, available at designer digitals. the week card is from studio calico's project life kit. i stamped the dates on and again used the SN@P stickers for the week 27.
what a week. we are about half way through summer, can you believe that? where did the time go? of course, as it seems to be the theme of the summer, i did more canning, apple sauce and fruit leather this week. i also took what i learned in my tie dying class from last week to make tank tops for my girls for our 4th of july run. d went to zoo came with his best friend this week. i used a totally rad lab filter on the image of james with the giraffe. if you haven't checked them out, you need to. AMAZING! they also have a phone app that rocks. on the tank top image, i wrote on the picture with precision pen again. on the apples i used a studio calico project life kit card, cut down and written on with precision pen. i believe that the "you make me so happy" was part of the studio calico journal card. the yellow card definitely is. the "hello story" word art is from ali edwards. this week i again used ali edwards' edge sentiment vol 1. for the t-ball picture, that's available on designer digitals. in photoshop i added "this kid." i love the weather journal card from studio calico. although, around here all we need is the rain card, ugh so much rain. the fruit leather has a corner of the studio calico journal card with a note on it. the boys at the baseball game got a love you wood veneer piece from studio calico. and lastly, the week card is a die cut card from studio calico project life kit, i added thickers on the top of the card and then kind of wove in the hello. that was part of another journal card that i cut out. i thought it was just fun. happy 4th of july! (4 days late, yes, i know.) i have been doing a lot of canning again lately, so i seem to at least have a pattern with canning and my project life completion and blogging. i will have some pictures and recipes to share with you on the projects page if you are interested. hope you had a great holiday. we had a soggy but celebrated 4th here in SC. went to a pressure canning class in week 24, very fun. up until that point i only knew how to do hot water canning. little denton and i had a special date night. and well, the canning got out of control. james went to see his first movie in the theater. lots of fun in this week's layout. i used the weather studio calico wood pieces on the picture of the boys playing in the rain. the remember on james first movie theater experience is from ali edwards edge sentiments vol 1. the card that is cut in half is from echo park papers available at michael's. the "dream" is also from a echo park paper card that i just cut the dream word art out of. in the t-ball picture (although its a little hard to see) i used ali's ihearttravel collection above denton's head, it says awesome. this was their first t-ball game and denton was awarded the game ball for standing out as a good player... proud mama. 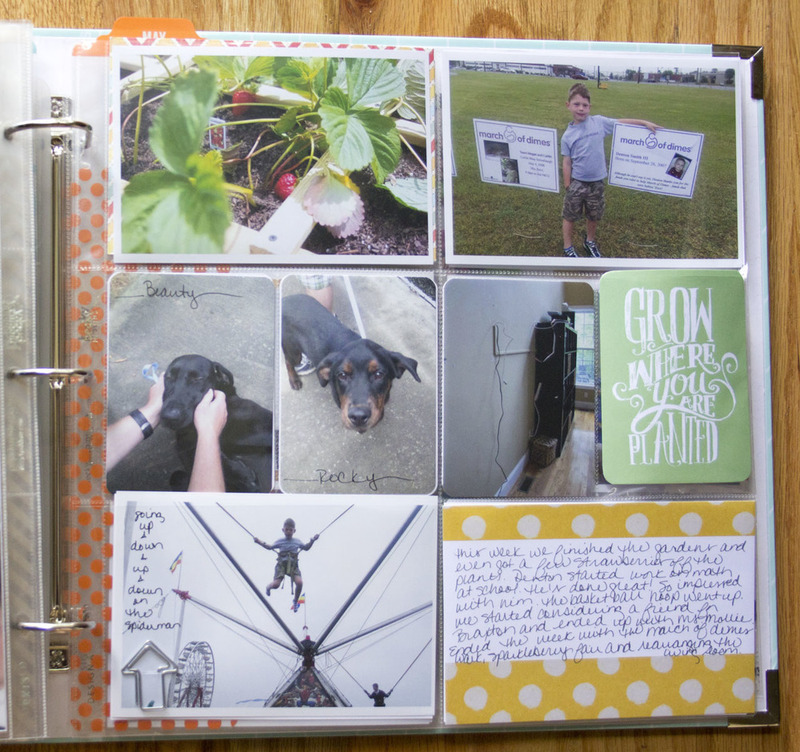 i cut down a journaling card from the studio calico project life card to make the note on the green bean canning. the funny faces picture has studio calico alphabet stickers on it. d and i had a special date night. we wen to a tie dye class and had ice cream afterwards. i played up the special date night all week. it was so sweet when we were leaving he opened my car down. not sure where he learned that but it was cute none the less. 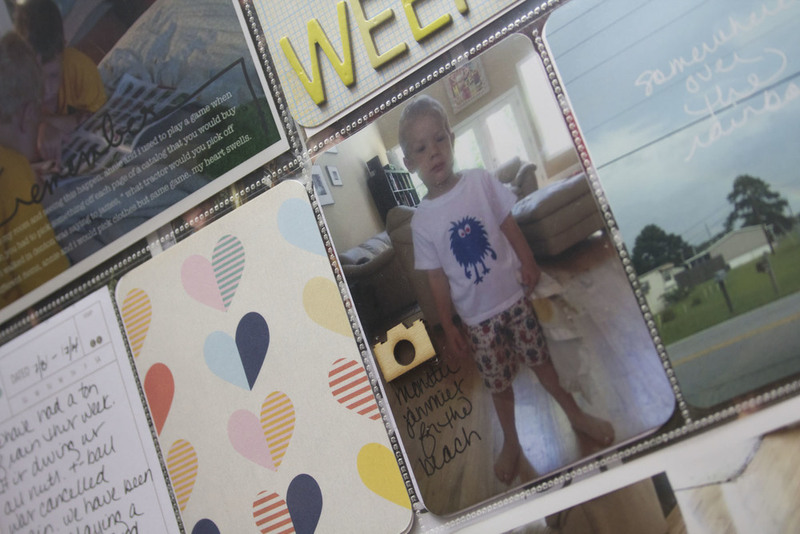 the week card was made from an echo park paper journal card. i added the stripped washi tape to it and the 24 from ormolu. the journal card with the orange star is from the clemetine project life collection. i used it last year. on the image of the snapping turtle i used precision pens to write on the picture. the morning card is cut down from the studio calico project life kit. and lastly, on the image of james "playing" t-ball i used photoshop to create a ez label look. hello, welcome to project life week 23.
this was a bittersweet week. the last day of denton being in pre-school, although he will still be in the same classroom with the same fabulous teacher and my BFF next year. his montessori program has them pre-k 3 to kindergarten. james said good-bye to our private sitter, an amazing woman, who has been taking care of the boys part time since d was 6 months. i cried dropping him off and picking him up all week. she will be deeply missed on a daily basis. james is the creative one of the two boys. he loves to cook and craft, if i have something out he wants a piece of the action. 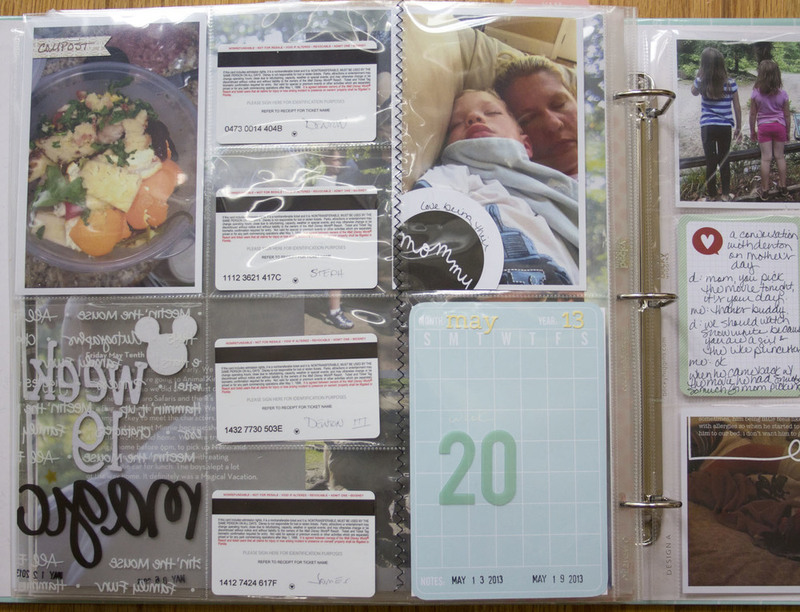 i used part of a studio calico project life kit card for the first image's journaling. stickers also from studio calico to document tropical storm andrea's arrival to the carolinas. i wrote on that image with the precision pens too. the two journaling cards are also from studio calico. i used ali edwards's technique two's summer rocks stamp series for the pink card. the one thing i love the most about living here is that its just a day trip to the beach if you want to go. so on our first official day of summer vacation, we packed up a bunch of friends and kids and went to the beach. no beach trip is complete without ice cream. for the week title card, again i used a studio calico project life card with thickers and a summer rocks stamp. on the picture of the boys with our homemade popsicles i used the totally rad actions in photoshop. they also have an app for your phone and i HIGHLY recommend it. the other images i used the precision pens to write directly on the photos. all and all, a busy week, a fun week, the start of summer week. playing a little catch up from the crazy canning experience. see the projects section for that post. here we are week 22.
this was denton's last full week of school. summer is just around the corner. i thought we would have lazy summer, late mornings but no we are one the same wake up schedule, same run schedule but the afternoons are a bit lazier. GONE is thickers that i sewed to the image, this is a series that followed my vein removal surgery. all that's left now is small marks. the hello? is the stickers series from the studio calico project life kit, march. below that i used the precision pens from american crafts to write on the image. the die cut is the reverse of the starter layout (which i haven't finished yet). it says summer joy when right reading. the last image on the left is my new favorite brooks running shoes. i wrote directly on that photo too with the precision pens. the first two journaling cards also come from the studio calico project life kits. the "learn grow happy love smile" is a card from the project life bridgeport mini edition. the last journaling card on this side is from the seafoam addition, i wrote on the stripes and then added the small gold stars from the studio calico project life kits. i like how that one turned out. i cut out a banner from a studio calico card and added handwriting to it for the "world;s greatest," i saw ali edwards create a image using the awesome card from the studio calico project life kit, i really liked how her's looked so i borrowed that idea. the rest of the journaling cards are also from studio calico project life kits. i added a wood heart which i colored with tim holtz's barn door stamp pad to color. the yellow heart on the black and white image is also studio calico. the last small image is has a cut down journal card from the seafoam edition with a wooden @ also from studio calico. the images of the salsa also has a cut down journaling card from studio calico, i added some handwritten text there and cut the card. the last card on this spread is also from the studio calico project life kits. i am really enjoying the kits, can you tell? this week i am also offering a free .png cut file of one of the die cuts i made for my layout. 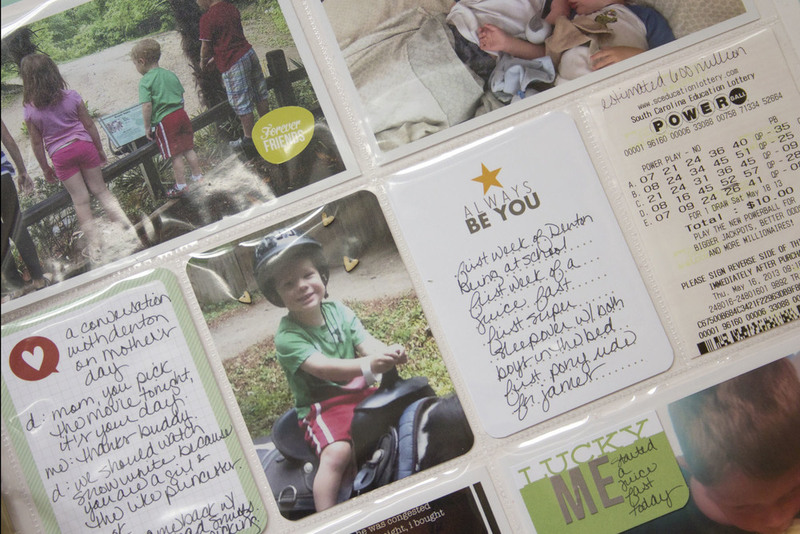 "tough guys" is written with the stickers from the studio calico 's may project life kit. the true story card is part of the sea foam project life kit as is the "you are here." i cut that down with a circle cutter and wrote on it with a precision pen. "the story of today" card is part of a series that i found at michael's. it is park of the echo park paper co, they have super cute stuff. on the strawberry cake i used a flag and put a wood "S" from studio calico on it. "live each ..." card on the title card is also part of the echo park paper co. then i used thickers to create the week 21. the arrow washi tape is from smash. the "super duder" flag comes from ormolu. "ride on" is a sticker from studio calico. then i wrote on the image with the precision pen again. i used the may calendar in the studio calico project life kit, and the blue card and today card are also from the kit. the butter dude image has a tag that says, "this little guy means SUMMER." the paper is from the summer series of the echo park paper co. the word summer are stickers from the march studio calico kit. i wrote again with the precision pen. the "never a dull moment" was something that i created with my silhouette. this week, a freebie for you is the "never a dull moment," .png. i hope you enjoy it! have a great week. week 22 should also be up this week. welcome to our disney vacation! since denton's deployment we planned on taking the boys to disney. we were planning to wait until they were a little older but with the military discounts especially when they first return, we decided that now was the time. we had a blast! somehow we managed to keep this from the boys. so monday morning, we got them up as usual to go to school. but when they came down we had a mickey and gift bags waiting for them, crudity of my bbf and then i added a few things. they were so excited yelling mickey, mickey, mickey. everyone got ready and we headed out for the 7 hr drive. most of the embellishments for this week, i can't give you specifics on. my bbf also put together a little scrapbook gift basket for me that included all things disney. i also used a bunch of stuff that i collected along the way while we were there. for example, the electric parade dragon has a parking stub on it. a lot of the word art that you will see came from a clear 12 x 12 sheet that was given to me. in the pocket, i put everything that we collected, the park maps, the fast pass ticket stubs that we never used, my written itinerary of when we had our character meals and where. this is what was hiding under the envelope. i used the clear scrapbook page and cut it apart for my week title card. the "week 19" are thickers and the mickey head is something that another friend found at walmart. we had so much fun and i wanted to remember everything we did, i decided to make this my day in the life project for the month of may. but i couldn't just pick one day, so i did all the days that we were there. yay! i had persnickety prints print them. they always do such an amazing job, good prices and are super fast! i created my pages in photoshop, then i uploaded them. when they arrived i put them in the 12 x 12 plastic sheets and they are in between the 2 disney pages. i'm really happy with the way they turned out. i am happy that i did the extra work to document each day. well of course, since i am not caught up here i am behind in the actual production of week 20 and 21. someday i will get my system for working down. i am however super excited that i got some new embellishments from two peas in the bucket today! yay! welcome to week 17 and also a day in the life on april 28. let's go! the big news for this week. we got a new dog, yep, that makes two. her name is mollie. we got her from midlands golden rescue. we are told she is almost 5 but the vet disagrees and thinks she is more like 3.
the garden is a growin' so nice to walk out the back door and have so many yummy things to gather up. we got our first 2 tomatoes this week. denton got a basketball hoops this week and he has been doing great in math at school lately. we also did our annual march for babies walk. team "will walk for peanut" raised over $3200 this year. the little camera card is from studio calico project life kits. i printed out the week number and date on the epson printer, cut them down and glued them onto the card. easy. i added a hash tag wood symbol from studio calico also and then wrote "so proud" with the precision pens again. the recorded card is from the project life seafoam addition. once a month i like to try and do a daily look at life, it's called a day in the life and is something that i picked up from loving ali edwards. so i just happened to pick the day we got mollie. i wasn't super detailed about the time which i have done a hourly look in the past. but today was more general, i divided it into morning, afternoon and evening and then the story of the day which of course was mollie. this is a 6x12 layout. on the back i created at grid of pictures that i took throughout the day. every year i take a picture of d next to his march of dimes alley picture. hard to believe that he is 5 now. we had strawberries ripen this week, i was very excited but we have none since. : ( the plant is healthy and growing but no new blooms. while we were hunting for a new dog we found these two cuties, beauty and rocky. after the march of dimes walk was the sparkleberry fair. d got to be spiderman for awhile. there is used the precision pen and an wire arrow that i got from two peas in a bucket. the 4x6 and grow where you are planted" cards are from studio calico as well. happy memorial day! let us not forget all the service members that have given their lives for the freedom that we enjoy. freedom isn't free. thank you! since i live in a free land i thought today would be a perfect day to take this new site live! i would love to hear from you. please like me on facebook at https://www.facebook.com/StephanieNaceDesigns or follow this blog and leave me some comments. thanks! so here we go, week 15. i am actually up to date in my project life but just behind on the blog so i will be working on that this week. i hope to be caught up but the end of the week. this was a very exciting week, lil'd started reading at school, he even read "the desert" book to his whole class. so proud of him. we also took james to old mccaskill's farm on friday, we all really enjoyed the trip. denton and i had a sushi lunch date this week. its been so nice having him back home. i wrote directly on the photo with american craft's precision pen. the "heart" this stamp comes from hello forever and was part of the studio calico project life kit for may. the two larger 4x6 cards are also from studio calico. the two smaller cards also from studio calico. i used the "let the adventure begin" stamp on d's image of his reading to the class. that stamp is from the same hello forever series. the cheesecake, by the way, is a margarita cheesecake, i will have to include that recipe on the projects page. the right side was dedicated to our trip to old mccaskill's farm. it sprinkled on us for a bit during lunch but it was a really great trip. this place is a b&b and working farm. they serve a country lunch on fridays. let me tell you what, it's some of the best food i have ever had! they have dogs, horses, goats, chickens, cows, pigs, pretty much you name it and it's there. james really enjoyed it. i took a lot of pictures there and these were the most touching for me. i loved how he studied the animals, he has a funny little habit of putting his hands behind his back, love it. nothing sweeter than watching him and his daddy together. i took the larger picture in the chicken coup, i loved the color shift. 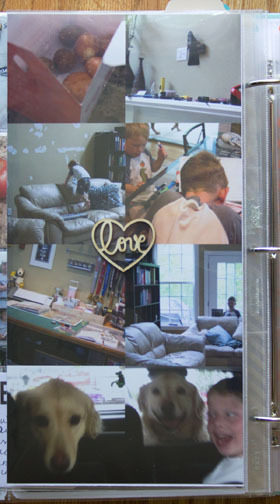 i made that an 12x8 image and then cut it up to fit the layout of the design A photo protector sheet. i cut a 3x4 card down and used just the circle of "you are loved," and then used the "simple & real" from the studio calico project life kits. yes, i have been behind. yes, i have been missing. but i have been working. since i got behind i decided to just start fresh. i wasn't really digging the last blog site, not enough bells and whistle and well i was just feeling blah. so here's the new layout, i hope you like it! decided to add onto our woodshop, so all the boys wanted to do this week was dig, play in the "hole," and be outside with daddy. i combined the week title card and my weekly journaling this week. i used paper that i got from studio calico. i used thickers to create the boys' weekend. the monday, tuesday... stamp came from the studio calico project life kit from march, i believe. honestly with all this catch up work, my workspace got a little out of control. the "hello" was a digital file also from studio calico that i cut out on my silhouette. the chalkboard sticker came from pebbles and was something i picked up at the paper source. the girl side of this weekend was spent at the country crop retreat, in north carolina. before we went to the retreat we had to go to our three other most favorite places, ikea, the cheesecake factory and the paper source. at the retreat i mostly completed d's project life baby edition (more on that later). the ampersand stamp came from the project life studio calico kit for may. the "serious tractor" stickers came from the studio calico project life kit for april. the 4-w are stickers from lucille. first off, my thoughts and prayers are with all the runners, families and bostonians. what is this world coming to where something as simple and freeing as a foot race is a target?makes me sick. this is week 13, i am currently working on week 14 too. this week also includes a "day in the life." i feel i say this every week, but what a busy week we had, never feels overwhelming in the moment but putting the layouts together each week makes me relive all the fun. i love project life. this week includes a lot of school related events, including denton's report card. so i included a journal card from the bridgeport design, i relayed a cute story about d, enthusiastically calling europe, "syrup!" so because i usually miss including his writing, i made sure to this week. i asked him to write his name and draw himself, instead he drew our family. love that. they had an egg drop contest at school, and i added studio calico stickers from the march kit on that picture. i decided to do a "day in the life," on march 29th. d had had a sleep over with his best bud the night before and then he went 4-wheeler riding that afternoon, it was good friday, just seemed like a good day. i wasn't as time specific as i have been in the past, i just did a brief summary on the events, morning, afternoon and night. i also made my own template and it was an 8 x 10 inch. behind "day in the life," is d's report card. 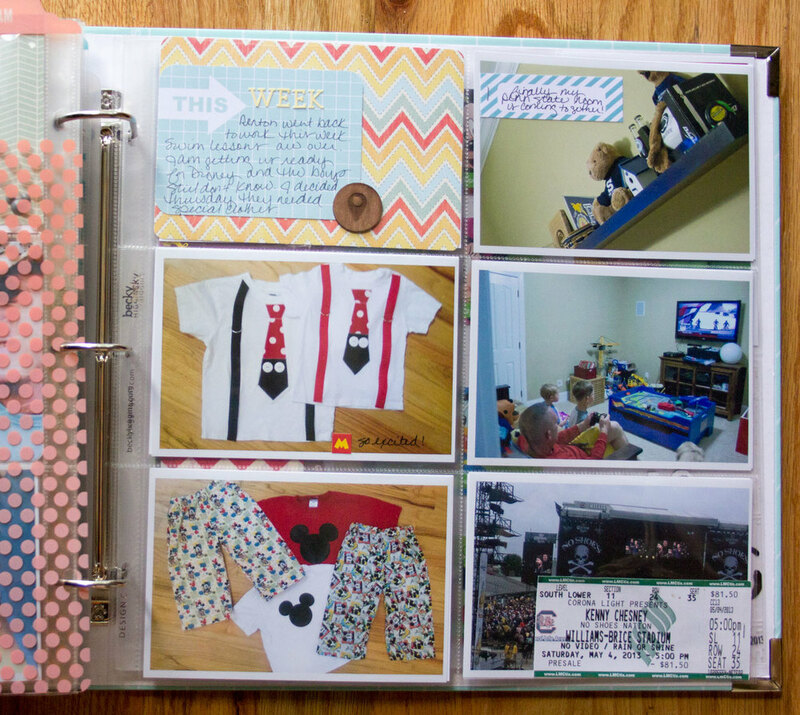 in case you don't know "day in the life," is a prompt from ali edwards for project life. it just is a reminder mostly of what your daily routine is like this point in time. i am trying to remember to do one a month. this is the back side of the journaling of the "day in the life." i mixed both small and large pictures and added on little statement of what event was going on. for the journal card this week, i combined a journal card into the week title card. i found some cute envelopes at michael's, recollections brand. inside the envelope i journaled on a becky higgins grid card and just slide it into the envelope. i used alphabet sticker that i also found at michael's, they were from snap, simple stories, to write out thirteen. i used a button, "this week," that was from ormolu. on the picture of Denton and james planting seeds i used a rain, rain go away card that was also included in the march studio calico kit. lastly, on the two images of the boys finding their easter baskets, i used a shrinky bird from darcie's heart and home. the little wooden bunny on james's picture was on the clearance bin at paper source in charlotte. LOVE THE PAPER SOURCE. so that's it for week 13, i hope you are having a good week. In "ali edwards", "becky higgins", "darcie's heart and home", "michael's recollections", "ormolu", "paper source", "project life", "simple stories", "snap", "studio calico"
i swear since Denton has gotten home, we haven't stopped moving. he has taken up all my regular "me" time or just my "get my stuff done" time. but of course i wouldn't change it for the world. so here is week 12. i have to put the finishing touch on the week 13 layout and then i will have that ready to share. i am actually on track with my project life production, just not with posting them here. this week james got his first ever hair cut, he's 3! he looks like such a big boy now. i used cathy zielske, tiny templates from designer digitals to create his before and after picture. the little yellow and white striped bag from studio calico contains some of his curls closed it with some weekday washi tape. 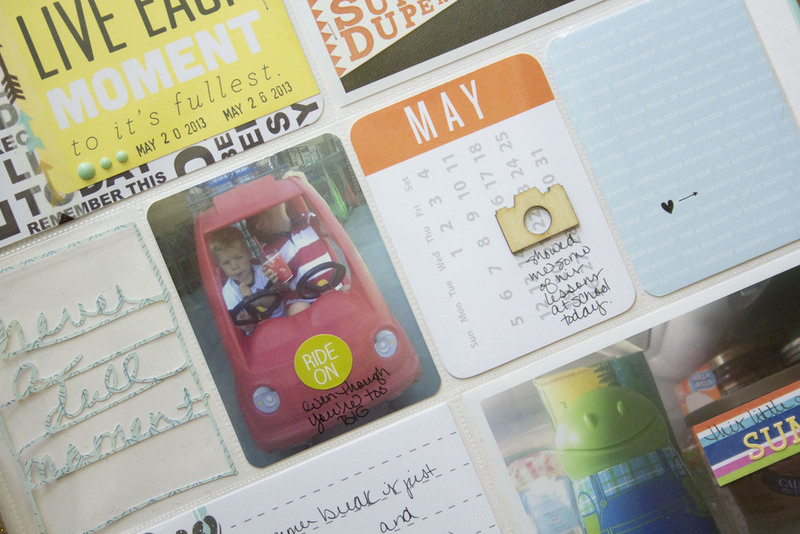 i used ali edwards' week day cards also from designer digitals to journal our crazy wednesday. the hello card is from the march studio calico project life kit. have i mentioned how much i love those kits, so fun. james had an heart echo done this week, at his 3 year appt the dr. heard a murmur, turned out to be nothing, his heart is perfect and beautiful. i used my wacom tablet to write that directly on the digital image before i sent it off to shutter fly. i used another 4 x 6 inch card from studio calico kit to create this week's main journaling card. i also used an technique tuesday ali edwards' stamp and some washi tape. on the right hand side, i used some small sticker from studio calico to write "gator boys" and "king of rebounds" on the pictures directly. the pictures of d with his promised 4-wheeler for being a good boy while dad was deployment, just make me smile, look how happy he is! the heart card and high five were also included in studio calico's march kit. the little yellow heart sticker was also from studio calico. lots of studio calico this week. well i have to go pull a margarita cheesecake from the oven, look for that recipe on the yummy goodness link. up next week :: lots of easter and school related activities. In "ali edwards", "cathy zielske", "designer digitals", "project life", "shutterfly", "studio calico", "technique tuesday", "wacom"
this was a really busy week as we had a TON of appts. james had his 3 year well check. were they found a heart murmur. this only scares me given the history of the loss of our first son to HLHS, d having a hole in his heart. i am hoping its innocent and we are in the clear with james but we will find out on wednesday this week. the card with his wellness stats also in the march kit from studio calico. since d and i both had dentist appts this week, it only seemed fitting to use the small card from the studio calico march kit. he did great at the dentist and has 4 teeth lose. i used thickers for the week ten card. and both boys got special one or one donut date time. i got a special treat, one of my most favorite things. a shamrock shake from somewhere i almost never go McD's. the "heart" happiness is was so from a card in the kit that i cut down to just the banner. d's basketball pictures came in this week. i can't believe how big he is. looks so grown up. 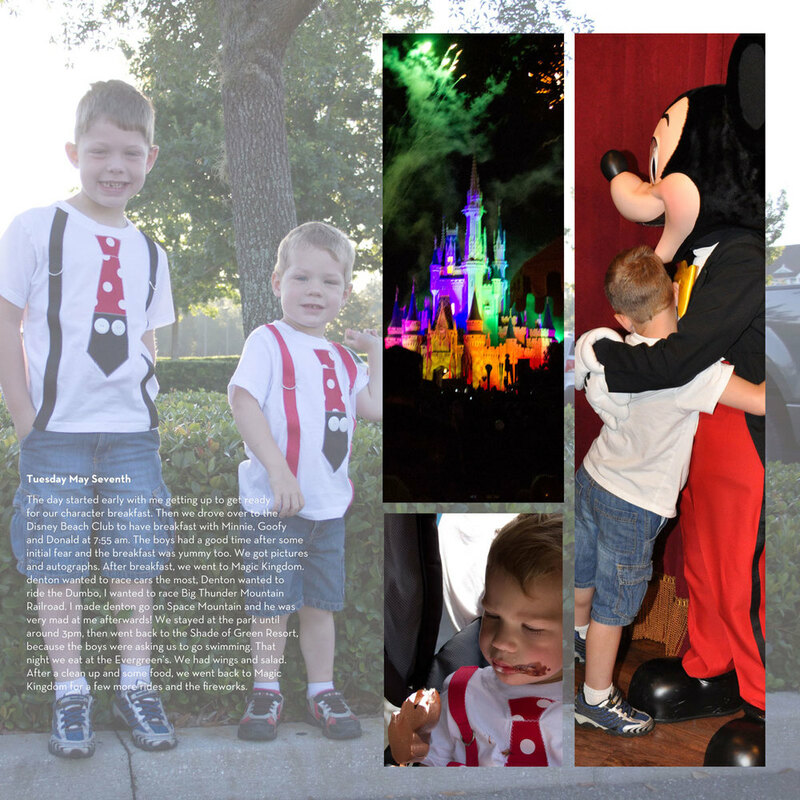 the top picture in the newspaper clip is my friends and me at the disney marathon weekend. our little town paper wrote the article and it was about local runners. super fun. so those were in a 5 x 7 plastic page protector from becky higgins and a 8 x 10 size. i started out running the columbia marathon this weekend. d and his class ran it a mile at a time and finished their last mile with their teacher as she finished her marathon. really cool event. i however, did not finish the marathon. the course was crazy hard, i had a back stomach virus that threw me for a loop for a good 2 days. i was worried about my hydration all week, so in the tenth mile i knew i would make myself sick by finishing the whole race so i humbly bailed out at the half. i used a cathy zielske tiny template from designer digitals for the collage picture of d's race. the picture of my husband is actually printed as a t-shirt transfer, i wore that for every race i ran since he left, that's 19 races! 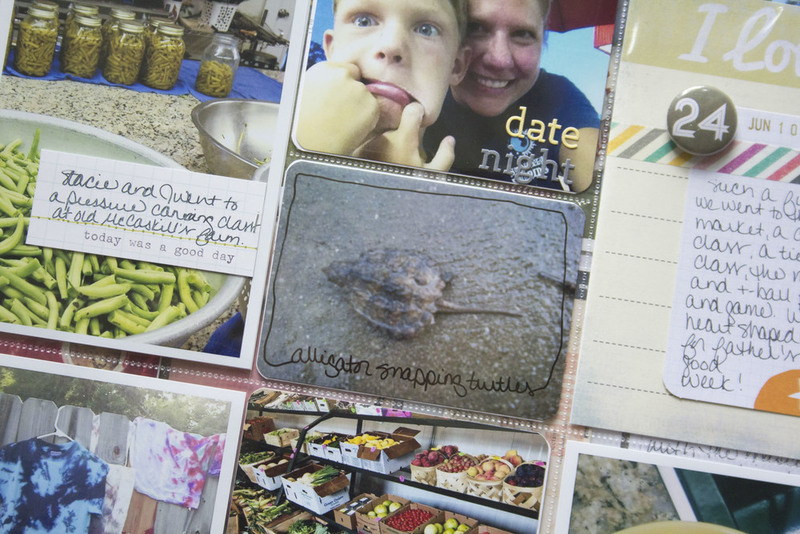 journaling cards are from the seafoam project life kit. and the last decorative card is also from seafoam kit with embellishment hearts from studio calico. lastly, the "being together" die cut is from ali edwards 4 x 6 family sentiment collection on designer digital. which i cut on my new SILHOUETTE, another new love of mine. so now we are all caught up. this week's most exciting news is my husband is HOME! safe and sound from a 15 month deployment in afghanistan. in that time i managed to keep myself and the kids alive. i feel very blessed. In "becky higgins", "cathy zielske", "columbia marathon", "project life", "shamrock shake", "studio calico", "thickers"
play catch up this week. last week was my spring break and so i got a little bit off schedule. in week 8 i used a 12 x 12 photo of the boys having a sleepover so this week i needed another 12 x 12 to start off the spread. i choose to take a photo of my most prized easter decorations. my mom and gram (her mom) painted these back in the 80's. my mom passed about 3 years ago and these were definitely in my memory vault from my childhood. i am happy that my sister and i didn't fight over them. putting them out each year is bittersweet. the little tag was from pixel & company and i printed it on vellum. the little bunny is a cute shrink technique from darcie's heart & home. they were in columbia a few weeks ago for the stamp, scrap, art tour. i have some plans to do some fun stuff with the shrink paper. the highlight of the week was my new wacom tablet purchase. i love this thing and seriously don't know how i lived life without it until now. the picture with d and the written ouch written on it was done with my wacom. it's so much fun. the picture of more touch boxes coming home says "soon you will be home," was written directly on the photo with a precision pen by american crafts, the home sticker is from studio calico. the "this week card is an ali edwards from designer digitals. the week title card that has all the dates on it was from the studio calico march project life kit. this is my first month getting it and i LOVED it, so worth the money and the waitlist. the hello is the install window from the wacom software, i took a screen grab of that. i thought the typography was fun. we celebrated dr. seuss's birthday with some special cupcakes from sweet. and probably my most favorite image from the week is d's picture of a the bear (or a he spelled it baer). this is the first time that he has written anything other than his name without copying it from a print out or someone else's writing. In "ali edwards", "american craft", "darcie's heart and home", "designer digitals", "dr. seuss", "pixel and company", "precision pens", "project life. ", "stamp scrap art tour", "studio calico", "sweet cupcakes", "wacom"